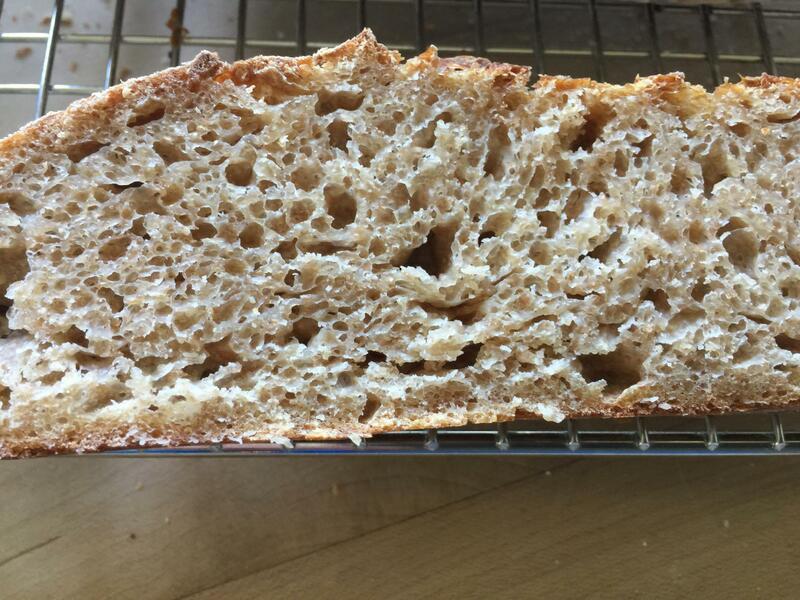 A baker on Perfect Sourdough has posted a number of times about using un-fed starter as levain . His argument is the hungry beasties are ready to devour the addition of flour in any form so why bother feeding them well ahead of time? I loved the idea and the reasoning certainly made sense to me. I had a couple hundred grams of starter in containers that hadn’t been fed in a couple weeks. I weighed it out and added freshly milled spelt and Kamut 32g each and freshly milled Turkey Red 150g, 2% salt and the levain about 250g enough water and KA BF to make an 1100 g batard. I always autolyse everything together for a few hours. Came back and it was puffy and lovely. Did three s&f at 30 min intervals. Left it alone for another hour or so then stretched and patted more or less like ciabatta and placed in my huge banneton. Retarded 18 hrs . Not a huge rise but oh boy... the fragrance and flavor are astounding!!! And the crust was the most crisp caramelized I could ask for. I don’t usually like “ sour” and neither does my husband but... this is fabulous with the gorgonzola we splurged on. The crumb is beautiful open tender and very cool mouth feel. I know many here were trying to get a more sour bread. This is it I think..don’t feed ahead of time. Looks fantastic. I’ve just recently got into sourdough. Believe it or not, I posted on my communities facebook page, asking for some starter, if anyone had any. Lo and behold, That afternoon I had my very own starter. I fed it a few days just to be sure it was alive and well. That week I started making sourdough biscuits and I haven’t looked back. Ive gotten to make some awesome breads but Im still pretty inexperienced. Anyways, I have been thinking about using my discard stater in lieu of active starter. To me, what was the difference, its all hungry starter when you feed it. Doing it this way, youre just feeding them a lot. I can see how this will effect rising/proofing times. Id imagine that it can also effect consistant repeatability. Once you get used to the changes Id imagine that you can dial in any recipe. Good stuff! 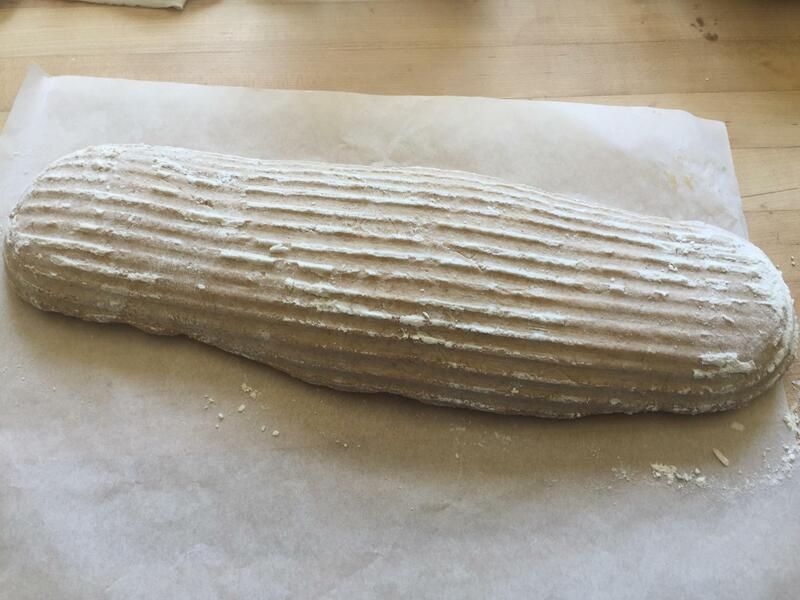 I am going to keep working with this as well as look up Mike’s posts again on Perfect Sourdough, A Facebook group. I do want to point out this isn’t “ discard” bread. I don’t have any discard. This is unfed levain and mixing enough flour and water to = the usual levain for the formula , then proceeding with the formula and allowing for adjusted development and retard times. All you are doing is skipping the time you would have let the levain builds develop outside of the final dough . I plan to fine tune times and post again. Will look forward to seeing your bakes! I've done similar in past out of not wanting to waste starter...and USUALLY it works, but it is more sour than I care for as a rule. I like it sour for rye however...and often add it to old recipe of a rye bread I got 50 years ago...and now use about 1/4 of the yeast it called for in the final dough. HOWEVER...I have some strange exploding sides at times when other times same recipe when I used 240gms of overly ripe starter...so this time I used less starter and very little yeast ...and basically did an overnight bulk rye sponge then added rest of ingredients...kneaded...shaped...then retarded 10 hrs. Work in progress. Still working on the amts of starter vs reducing the yeast cause of the exploding sides when I used 240 gms of starter. Original recipe called for 2 pkgs of yeast...I have been adding rye starter over the years to find the sweet spot...but this recipe is one I got from a German Baker in the 70's...after mixing then short 20 min rest then shaping and it had an "cool rise" technique overnight . That was the way it was described. Not sure why I got the spread on the cut with the loaf vs the logs...but suspect it was due to my putting the loaf in AFTER baking the logs...and covering it with bowl. I put the logs in a bit lower heat cause I wanted soft sandwich sized rolls. Perhaps that extra 30 mins in a better heated oven was reason. that looks wonderfully dark. I have a Heidelberg rye recipe from the back of a yeast packet from the 70’s. Would like to try yours. As I pointed out above this is not discard bread. 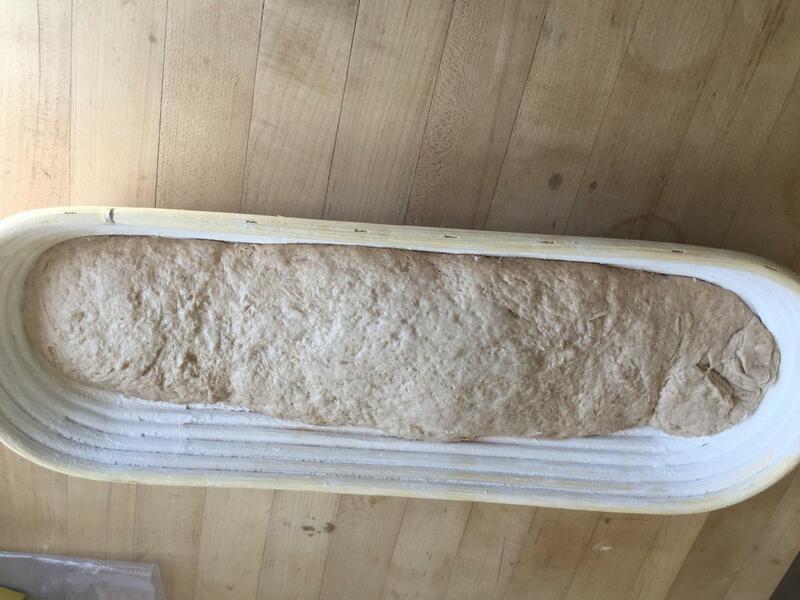 This is unfed levain with the addition of flour and water to get it up to weight BUT not left to ferment instead it is added to the formula at the autolyse with everything else including salt and let to develop. My use of the larger amount of levain this time came about due to overbuilding a couple weeks ago and having extra levain. In all future experiments I will take 30g stored starter and add enough flour and water to get my required weight of levain and then proceed with the formula final dough ingredients and put it all together thus eliminating the levain builds and all that will remain is the guess work on times for dough development and then retarding . I think starting with the 30g of levain will make a huge difference and will more correctly explore the technique of “ un-fed starter” . This bake I posted here wasn’t what I am headed for ultimately. Stay tuned! If you saw my recipe...you'd probably be confused with all the ink smeared...but I will see if I can figure out how to do it in such a way to not confuse tomorrow. Reason I say this is it is an old old written recipe...that I converted to gms...(sort of) using a flour calculator... and I'm not up to the whole bakers formula thing with this dough. But I'll give it a try if your willing to try it. This is my adult sons favorite bread recipe...and the paper looks like it. That is super interesting and something I've meant to try but haven't gotten around to. Thanks for sharing! This may be what gives me the confidence to give it a go soon. you can read the above responses but this is just the start of the exploration. It’s inaccurate as far as my having started with a large amount of un- fed levain. All future experiments will be with a true small sample of starter and build one time up to weight BUT skip the fermentation of that levain separate from the main dough. It may be that this will simply be an example of SD using tiny amounts of levain and extended fermentation . If so I may backtrack and purposely feed up my levain and let it mature and then store it for a week and use it then as in-fed. I need to do some more reading. 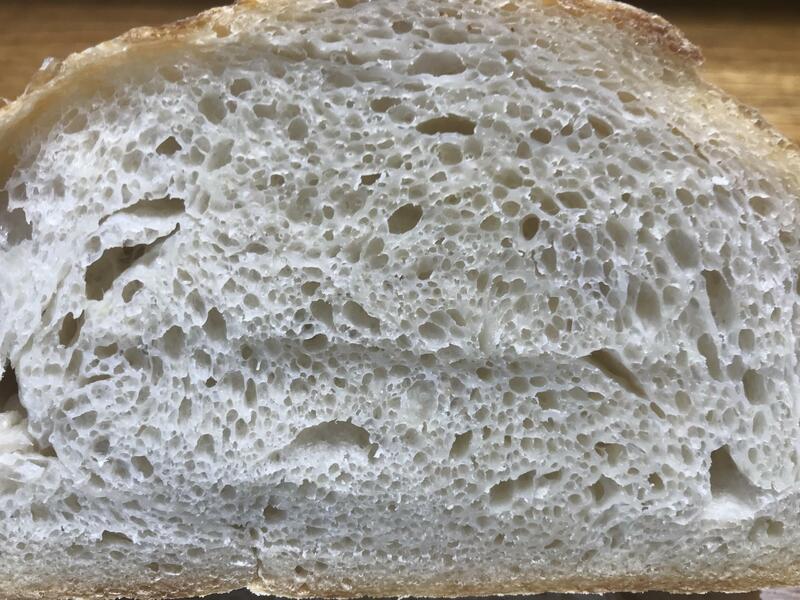 Your bread looks delicious Caroline, a very nice delicate open crumb! The idea of using sitting starter directly in the dough mix instead of a pre-prepared levain seems reasonable - it's essentially the same thing with the bulk fermentation being the nurturing and growing phase for the yeast/bacteria instead of first preparing them and invigorating them in a separate levain preparation. More of a test of one's baking intuition though, the degree to which your starter is dormant/resting will be a variable for each bake and determine when the dough is ready. Would also affect how sour/mellow the bread will taste with longer bulk fermentation/proofing and the slower rate of activity. 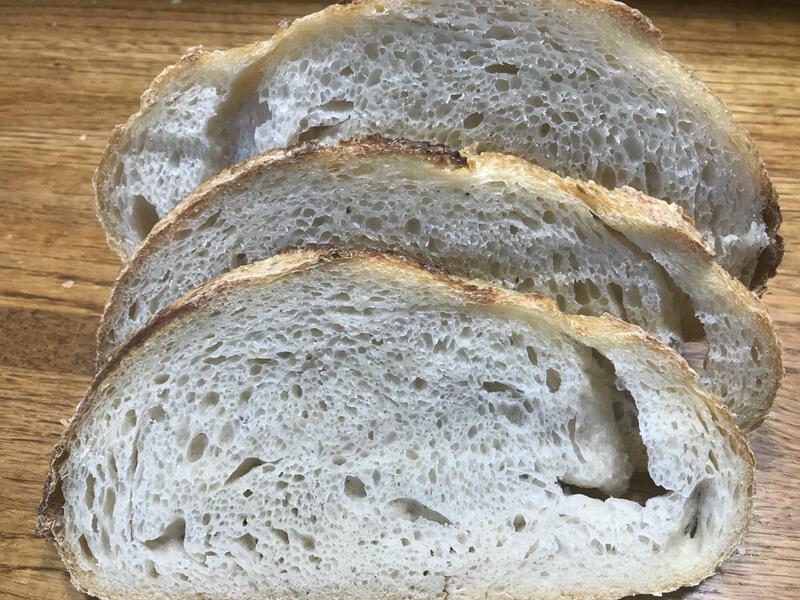 More stuff to ponder and consider while learning how to bake sourdough bread, thanks for posting your experiment! I'm not interested in all white breads nor am I interested in using a mixer or having a 60% hydration dough LOL...I guess I don't want to follow his ideas. What did happen is it stimulated my exploration of this concept of not prefeeding the starter. You are definitely correct that it requires watching the dough. I have some thinking to do . Will post future attempts. My bulk this time wasn't long at all and I was trying to avoid over proofing . The Kamut always speeds up the dough in my experience. My starter was mostly rye and I did freshly mill the three grains so that sped it up as well and I used a sizable portion of starter to begin with . I've been using this same Guiado recipe for weeks now...and I LOVE it. In fact I am having a peanut butter and honey treat on some 3 day old slices now. I saw it first on a blog here...who was using the one that dmsnyder had posted of this recipe. I have used a rye starter as well as a white/wheat. This last bake...I retarded to 36 hrs...and the sour is just right, BUT the dough was very thick skinned to score...and a bit thicker on bake than I wanted. I baked first 4 bakes cold dough (preheated oven)...in a cold pan with cold lid in a 430 oven because I have a crappy oven. 3 days ago...I baked on a preheated stone with a cold bowl covering letting dough sit at room temp while preheating cause my frig was at 38%. Dough wanted to hang on to the banneton this time...and the linen was rather damp after the 36 hr retard. So I guess it was good the skin was thick. LOL! I will definitely use more aggression in scoring such a long retarded dough next time. However the other bakes... at shorter retards were easier to score and bloom...the crumb is more open this time. Forgot to mention...this time I used all purpose flour instead of strong flour....and I will do it again! i had briefly looked at the other “ sour” experiments but since I didn’t think I wanted sour I didn’t really pay attention to what David et al were doing. Since I find we do like this sour taste I shall continue exploring. I will not be using all white flour though or a stiff 60% levain... I actually never measure any of that just go by feel anyway when making up my starter and adjust dough water as I go along. 😱 I never have any idea of my dough hydration percentage as I frequently spray water on it and the counter to aid handling. I’m going to head in the direction of unfed starter/ liquidy levain/ multigrain fresh milled flour/ moderate retard and see what I get. Will likely also incorporate YW into the experiment and see what I get. It will cancel all the sour though so won’t be doing it anytime soon. Don’t want to muddy the water too much lol. I said my 36 hr retard was sour...but it is NOT as sour as say a traditional SF sourdough. 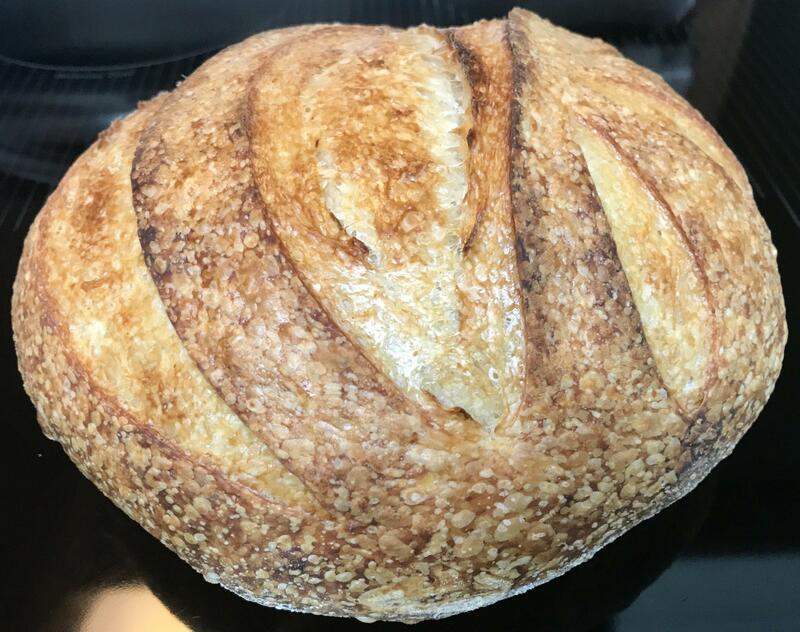 I too tended to skip past a lot of posts cause I really wasn't wanting "sour"...and I had been going for a young levain, Tartine type bread just for "practice". BUT I can't seem to manage the high hydration doughs in my crappy oven in my new apartment. Long story...suffice it to say...I needed a pure levain or sourdough starter bread with less hydration...and the one posted was at a 60% hydration...so I thought why not try it. So I started trying different retards. Only reason I went 36 hrs this time was cause I got busy and didn't bake it at 24hrs...so I decided to wait another day...fully expecting a loaf that was going to be flat and too sour. It really did surprise me that the crumb opened up after that long fermentation and at 60% hydration. We know that more mature starter has accumulated more acid. Years ago, when tweaking Peter Reinhart's "San Francisco Sourdough" from "Crust and Crumb," I found that sticking the "barm" (sic.) in the fridge for 2 or 3 days produced a more sour bread. In fact, as I recall, Reinhart wrote about this in the recipe. I don't see any reason this wouldn't work with any levain. I aim to play with this effect soon, but probably not until after Passover. My next bake will be a return to my favorite of the last few years - a riff off of Forkish's "Field Blend #2." Hmmm ... Maybe with a longe cold retardation. for looking. I think it is also the hydration of the starter as well as the flour feeding , right? Affecting the sour? i am a novice at this as I have shunned sour always! Til now with the great cheeses from our new shop . Also lovely olive oils new to us to explore. I have decided the next exploration will be mixing enough levain for a good size loaf x 3 and use one batch at 1 week old one at 2 and one at 3 ... all fed the same flour on day one and sealed / refrigerated and left to age. Will post back. Hey Caroline! I have a acidic levain based dough BF now. It will BF for 16-18 hr @ 77-78F. I reduced the hydration to 65% is hopes of avoiding degradation. I was concerned about the lack of yeast because of the super acidic starter, so I used 50% old and acidic starter with 50% healthy and vigorous starter. My formula uses 2% prefermented flour. I did the bulk ferment at room temp...72 here at that time and then shaped and placed in the fridge for retard. I didn't even try to leave out at room temp for that many hours !! Brave you are. I made up 3 batches of freshly milled durum based levain today at 75% hydration and after a few hours and it was full of bubbles I added another 25% water and vigorously stirred it and moved it out of the oven with light on to the cool window sill for the night. This will be my 3 levains to use one per week starting next Sunday. I will place them in the fridge tomorrow morning. Will try and keep better notes than usual :) ....I think I'll write them down later but then I forget details and it never happens !! According to Mike's reports there is never any reason to feed up a starter unless you need to increase your stored amount. He just makes up a big batch and uses out of it till it gets low then adds more to it. He only uses white flour though and doesn't autolyse . Since I want to use fresh milled different grains and extended autolyse in place of handmixing and since I don't want to do a long room temp bulk ferment nor do I want to do the KA mixer nor do I want to do low hydration I guess I have jumped the ship !! We'lll see where this all leads. The batard is ALL gone LOL ! We loved it with the strong gorgonzola and it made the most amazing grilled cheese sandwiches. My 16 month old granddaughter couldn't get enough of it...should have taken a pic of her devouring the slices. Did you make 3 separate batches. Why not make 1 batch 3 times as large. Also, I’d imagine if your formula called for 100g levain you would make 3 100g levains for the frig. Is this correct. Do you add the levain to the dough cold or do you let it warm up some. I am intrigued by this idea. My test dough is rising like a beast... I expected the opposite. i wanted to be able to have a measured out amount of starter and not have to delve into a large batch to get out what I needed for the 3 batches of bread I intend to make over a three week period. Whether it would make any difference I don’t know. I let the containers stay out all night and stuck them in the fridge this morning. I dated each container. Next weekend I’ll mix up a batch of bread. I think I’m going to try different formulas each week. Probably for scientific purposes I should do the exact same with exact same flour but I don’t really want to make the same bread each week. I let the starter warm up as far as taking it out when I first start assembling my ingredients. I also use slightly warm water just to get everything going. Initial results seem to indicate a winner! I got SERIOUS sour. I may have finally reached the point of “sour saturation”. I have never tasted a bread yet that was too sour, but I may be quickly approaching that limit. I struggled with the concept of using old, overfermented starter. This is not the first concept of yours that I have struggled with. Remember the Graniteware? I used 2% prefermented flour. That’s 40g levain @ 100%. Being a chicken I choose 20g overfermented and very sour levain and 20g healthy and active starter. I thought the old starter would need some active yeast, thus half the levain came from my active starer. The total flour was 1 kilo. In order to BF 16hr @ 80F I reduced the hydration to 65%. BOY, was the BF active! After running the initial test, I think using all old starter will be fine. Should have listened completely to you. The hydration was low so the crumb was not open, but flavor was my goal. And achieve it I did. The sour flavor was intense, more so than most of my other bakes. This bread screams sour. Please send links to Mike Giraudo’s information. I followed the link you posted, but didn’t find relevant information. I am not FaceBook savvy. the crumb is like what I got but you got more rise. As far as the amount of starter to use and the hydration I’m glad to see your results. I’m on my phone so I’ll look up a different link to Mikes posting on his concept. He doesn’t say too much though. You give me WAY too much credit for innovation lol. The graniteware is still my go to baking apparatus. Was your starter all white flour? I’ve only ever baked David’s SFSD . Maybe that’s what I’ll do for my bake ,first of 3, next weekend. Both starters are fed 15% whole rye to increase the sour. The active (yeast maxed) starter is not refrigerated. The over fermented starter is retarded in order to increase the acetic acids. It had hooch on the top and was stirred in. I love when someone breaks the mold, climbs out of the box, and dares to go against the grain. When all others are heading to the left, this person ventures off to the right. The phrase, “you can’t do that” only serves to spur them on more. He or she is bold enough to try the unthinkable. ...and sometimes they succeed! God Bless the renegade. Today I am experimenting with Roger Lambert. He claims that probiotic capsules will greatly increase acidity. When it comes to sour dough there isn’t much I won’t try once. If his yeasted version succeeds, I will try supplementing the levained SFSD with the bacteria. Haha...you've already got me when you feed 15% rye....I don't measure anything when it comes to my starter. I just throw in some flour and add water till it feels right. I do weigh the amount before adding to the formula I am using but as far as percent of flour or hydration I haven't got a clue. I keep all my starters in the fridge as I don't have time or patience for dealing with them on a daily basis. Also I travel too much. That's why Mike's system of using unfed stored starter was so appealing. Also to get rid of the sour all I do is add some of my YW and voila it's all gone ! My husband loves loves this bread...we are on the last piece today. I froze half the loaf. It has an amazing fragrance when toasted and grilled cheese with Gruyere is simply a gourmet treat on this bread. We'll see what I end up with next week. I still have loaves in the freezer of the chocolate bread I made and it is amazing but it is so rich. And my Challah with YW is the best Challah I've ever made...tastes and feels exactly like brioche without all the butter and effort to make it. I am glad to be " outside the box" and thank you for appreciating it !